I love coffee!! Thank you so much for your delicious article, mainly because it finally led to my husband to buy a French press! You’re very welcome, Tina! Just make sure you avoid the adults-only recipe until later in the day, and we’ll have some more curious coffee recipes for you in the coming months! join your competitions in the future! I want a free subscription to your magazine lol. Thank you, Emily! We’re glad that you enjoy the magazine, and we’re thrilled that we’ve helped you rediscover your passion! Now get out there and send us what you’ve done through our Facebook @enrichmagazine! I have only just started reading your magazine this year as I have been living in Australia with mom and dad. There are lots of good magazines there, but this one is full of articles that cover lots of different topics, not just a health medical mag. Can I contribute some articles about life in Australia and now back in Cebu please? It sounds like you had a great time living in Australia, and are also happy to be back home in Cebu. I am sure that you have some good tales to tell, so please send any articles in to info@enrich.com and I will be happy to review them for you. Thank you so much for giving us readers a lot of pleasurable reading last year. My mom has been buying enrich since it first started, and I have been reading it since I left college. Can I ask you to put more articles in that help us younger generation to help our senior family members when they need us. Thanks for your kind words and request on future article topics. We always consider these very seriously and I will work with the editorial team to include them in the future. Hi Enrich, in your last issue I noticed that you had a promo to win a holiday on Boracay. It’s a great idea and I even entered and wish all my friends and other readers help me to win. Please keep these promos going so other readers can get the chance to win also. Good luck with your entry, I hope you still enjoy the fun of entering - even if you don’t win this time. And if you do, you and your friends can still keep entering, because, as you suggest, we will be extending the promotions as often as possible. I have just returned to Manila after being in Australia for three months. While I was away, I asked my brother to buy copies for me so that I wouldn’t miss anything. Now I have a lot of enjoyable reading to do. Thanks for making my home return a pleasurable one also. It’s our pleasure, Carleen, and thanks as always for the support! Next month might just have an article on something to do with Australia, but you’ll have to wait and see! Hi Enrich! I just wanted to let you know that my entire class enjoys reading The Mystery Remains every month. Sometimes it’s weird, and sometimes it’s just plain creepy! We love it! Thanks, Enrique! We noticed that your name is almost the same as the name of our magazine… but did you notice the recent redesign of The Mystery Remains? We wanted to ‘creep it up’ a little more for you all! Thanks again for the feedback! John Montero’s article (A Race To Win? ) in your March issue was a real eye opener! I had no idea, and neither did my Sunday morning jogging group! It led to some really interesting discussions, and further research! When our biology teacher is back from her leave, she is certainly going to have some explaining to do - haha! Thanks again for the really, really interesting and thought-provoking article! At 74, I have undergone cataract operations on both my eyes. And just lately, have been lasered. Despite of this, I didn't stop reading Enrich magazine. And I will continue reading it as long as I can read. Just recently, my grandson asked me what I want as Christmas gift, and I said I want a subscription of Enrich magazine. I have been diagnosed to be psychosomatic and presently suffering from neuropathic pain. I wish to understand more about my ailment. I hope you could feature something about it. Thank you and more power! It really does bring a smile to our faces - and an occasional tear to our eye - to read such comments, ma’am, and you can rest assured that next month’s article lineup will feature what we hope will be some valuable and interesting reading for you! Thanks once again for your support, and our thanks, too, to your family for being so helpful to you! Just a quick note to say that my mom recently returned from a brief business trip to Naples and said that it’s as beautiful as it looks in the pages of your magazine. Our thanks to you and your team, because the article allowed me to feel as though I had already been there, making it a great reference guide for talking about the city with my mom! of us had any problems at all enjoying the article together. Please ask kuya Dennis if he can profile another of my dad’s favorites - Eric Clapton! Thanks for the great feedback, and we’re thrilled that you enjoyed the experience with your father. As most people are, we are also fans of Eric Clapton, and you can rest assured that we are working on your request! Dear Enrich magazine. Your April issue was one of my favorites so far! I really am enjoying the new lineups - it seems you pretty much have a few celebrity writers now! - not to mention the new designs. I studied design in Arkansas for a few years, and it’s always a pleasure to see the work of those like myself who clearly love their jobs! Thanks, Johnny! The entire Enrich team is essentially one big happy family, and to say that we love our work may just be an understatement - but thanks for noticing! Dear Mr. Arnaldo and the Enrich team. finished, I must say that it has been a thoroughly interesting and engaging journey. I have been a fan of his historical pieces for many years now, and I do hope that he continues to write about such a diverse array of topics from our past. Please extend my thanks to him, as well as to the rest of your team. Thanks, Billy. I will certainly pass on your kind words, and rest assured that Malcolm is now and will remain a regular fixture of our editorial team. There are several other series of historical articles lined up, and there’s an independent article on page 52 of this month’s issue entitled He Shared the Glory of that Glorious Day that you’re sure to enjoy! It’s no surprise any more that your last issue was great, as the magazine you make truly does seem to improve with every issue! I really hope that you can publish my letter so I can show off to my classmates this February when I return to school after having to travel to China with my extended family for a wedding. More power to your magazine and keep up the good work! Thanks, Jun! We hope that you and your classmates enjoy the issue and that the air pollution in China wasn’t too bad! Happy Valentine’s Day to you and yours! the fact that it truly is a Filipino publication - it’s something that makes us proud to be Filipino, and it takes our minds off of the other issues that tend to cause us strife. For this, my family thanks the entire Enrich team, and we must wish you more power for the New Year! gain your approval, and we are sure that you won’t be disappointed. Thank you for taking the time out from your busy life to write to us; we genuinely appreciate it! Merry Christmas and a Happy New Year to your editor and all of the staff! Thank you for the wonderful compliment, Ronnie! We are always thrilled to know that Filipino families are willing and able to use our publication as a means of family bonding experience. A very Merry Christmas to you, and here’s to 2016! Thank you! are looking forward to exploring with our nieces and nephews this coming December when our break from work (finally) starts. Thank you, from my entire family, but especially my husband and I! Thanks as always for the kind words, Grace, and we are again genuinely honored to have the families that read our magazine bond over the articles that we have painstakingly selected for you each and every month for over seven years. An advanced merry Christmas to you, your husband, and of course your extended family! I have been an avid reader of every page of your magazine. I focus on the articles about health and literature. I used to teach English and Literature so I prioritized reading those which concern my interest. As a senior citizen, I still like to sustain this interest by always buying the monthly edition. What amazed me in the August edition was the article written by Eva Angcanan about the ICM sisters who have worked for five decades in the vineyard of the Lord. For your information, these nuns have been my models too. I have known most of them since I stayed in their school for almost three decades; further, there are other ICM nuns who are like them, doing missionary work in different parts of the world. The ICM school became a haven for me and my three daughters who also graduated there.Thanks to the author for featuring the super heroines of our times. I salute them! I look forward to seeing the faces of the other nuns in the next issue. More power to Enrich! Thanks, Francisca! On behalf of the entire editorial team, and Eva in particular, we would like to thank you for taking the time out of your schedule to write us such a wonderful letter! 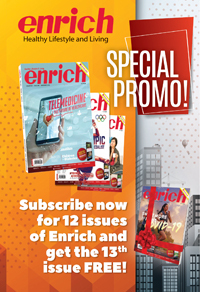 We sincerely hope that you continue to enjoy Enrich magazine, and we promise to continue to present to you and our other readers an array of interesting and thoughtprovoking topics! Good day to the Enrich team! Thanks, Megumi! We are very pleased indeed that you and your husband both had a wonderful day, and we couldn’t agree more that such wonderful finds are another thing that makes living here at home such an incredible experience. Keep exploring and thanks for your continued support! I have been working as a graphic artist for over 20 years and have - thankfully! - worked on three continents (so far). I have to tell you that I really like what your designers do with the magazine. I noticed a few years back that the magazine underwent a redesign and it looks really great. It’s not like other magazines I can see here and it’s also a great read, even though I am not a native English speaker (La Belle Époque was really awesome). If I didn’t own my own firm, I might even ask for a job on your staff, haha! Merci, François! Coming from such an internationally experienced artist such as yourself, we must say that we whole heartedly and most gratefully accept your praise, and will continue to strive to improve Enrich each and every month. We hope you enjoy this issue in particular with our article on a man you might know named Napoleon! I must thank you because I am a big fan of American football and find it really difficult to get my fix when I am here and not over in the States. It’s not quite the same uplifting experience to watch it just on the television so thanks again for the interesting article. But who doesn’t love Tom Brady right? It doesn’t matter what they say! I will always be his number one fan! Haha. Thanks, Josh. Despite Tom’s new label, nothing - in our opinion - can be done to erase the years of world class ability that he’s displayed, so we’re absolutely with you on that one! Thanks again for writing in! Every summer, there is one thing I really look forward to… and that is our annual family trip to Siquijor!! Your last issue’s cover story looked great and Mae Anacay’s writing and photography was just perfect to portray a place so close to the heart of my whole family. Thank you Ms. Anacay! Thank you, Pam, I will be sure to pass on your kind words to Mae and we hope that you enjoyed your most recent trip to Siquijor as much as you enjoyed the last! We would also like to recommend Dumaguete, which you can read about with Kara Santos in this very issue! Thank you for your January issue. The cover was truly inspiring and as soon as I saw it, I had to have it. The Pope really is a progressive man and I think that it is great. Mr. Macpherson’s article on La Belle Epoque painted a very nice picture in my mind’s eye and I can’t wait to read the follow up. Keep up the good work and keep on inspiring. Thanks again and more power to Enrich magazine! French society of the time will return once again. Thanks for taking the time to write to us on Facebook, Joanne! your magazine! Keep giving us the news that matters! Thank you, Celine! We are very pleased to have both the ladies from the Kayema Xperience and Alyona from Shake It Up! onboard. We truly feel that the monthly additions we are making to the magazine would all be considered improvements and we are proud to suggest so. The situation you refer to is indeed scary and we hope that you’ll spread the word among your circles! To my favourite Enrich magazine! Once more you have made my day! Thank you! I don’t know how Sir Mauricio Torres finds so many interesting YouTube channels but they are all so good so far and I am already looking forward to the next installment. Just when I think my magazine can’t get any better you prove me wrong. I love The Blog Log also! More power to your editor and talented writing staff. Thank you! Thanks, Raul. We never tire of hearing that our hard work is genuinely appreciated by our readers. Without you - all of you - we simply wouldn’t be able to produce such a quality publication. Thanks for your support and we hope that you will enjoy the new features that we’ve introduced this month. I really like the one page and two page things you have in your magazine. Where do you keep on coming up with things to write about? I especially like the Beauty Bosses and Alex is so pretty!! Why are there never pictures of Chelsea? Is she really so mysterious? Haha. Thanks for another nice edition. I always wait for my mom to buy it each month from Mercury. out there, as you can see from our features on Paris and Strasbourg this month. Bon voyage! for the month to other month issues. you know im almost 3years a avid subscribers or reader of enrich magazines. From now and then I’m so excited for the new issues. Thanks a lot. Thanks, Jeffrey! As you may have noticed, we have recently been diversifying our content beyond anything that we have produced in the past. The feedback so far? Great! With your letter, we received hundreds of others from readers who are as pleased as you are. As a result of this, we are equally pleased and would like to thank you and each of our other readers for the support! From hereon, the only way is up, and this issue will certainly be no disappointment! certainly seems to be picking up since our “relaunch” in our 5th anniversary issue back in August. about, and if you have any suggestions we would love to hear from you! First off I would like to say that this is the first issue of your magazine that I have bought, as I have been out of the country for many, many years. What made me buy it? The fantastic cover! I was living in Boston for the last 13 years and this was a pleasant surprise for me because I was only “home” in Manila for 3 days before I went to Mercury Drug in Makati. I took the magazine home to my mother to show her my new discovery. It turned out that she has been a regular reader for 3 years. No bonus points for me then!! The rest of the magazine was a great mix of history, health and entertainment articles that is making me look forward to your next issue!! Thanks Enrich Magazine! Keep it up!! and are able to share the valuable advice that our contributors present to you each month. We hope that you enjoy our future issues as much as you enjoyed the last, and while there might not be another feature on Boston for a while, we’re sure that after reading this issue, you’ll be looking into when you will be able to visit London and Brazil! I am an incurable tennis and overall sports fan and would like to thank you for the series you are doing on the Grand Slam tournaments of tennis. I am writing you this letter on May 29 (in the middle of the first week of The French Open) and really enjoying the action while being able to compare what I am watching on live television as the tournament progresses with what is published in your May issue about the tournament’s history and present stars in action. I can’t wait for your June issue, which I trust will include a feature on England’s Wimbledon, the third of the annual grand slams. I’m confident of its appearance in June because last January, Enrich also did a feature on The Australian Open that is held annually on that month. Kudos to your magazine as I anticipate more sports articles to give us fans some good entertainment from the world of athletic competition. Such features even motivate me to go out and be more active, to tell you the truth. Thanks for the feedback, Faustino, and congratulations on being the first Letter to Enrich to be published in our new format! benefits of regular exercise (be it in the gym or on the tennis court), and we hope that you can inspire at least one of our other readers to follow in your footsteps on the road to wellbeing. and sporting events on a monthly basis. Thanks for your letter, and we hope that you enjoy our new format! After reading “Treading the Treadmill Rumors” I’m now in the market for a treadmill. What are some good questions to ask a salesman so that I get the right one? It’s actually the salesman who should be asking you the questions, Arnel. Questions like how much you weigh? Are you primarily going to be walking, or jogging on it? Will you be using it at an inclined angle, or for the most part at fl at level setting? Are you interested in programmability? Do you need to monitor your heart/pulse rate while you are using it? Or, know the exact distance you are covering? These and other such questions will determine the level of sophisticated features that’s right for you, not to mention how sturdy or heavy duty the treadmill needs to be. The more basic and lightweight a unit is (more applicable for an intermittent user), the cheaper it will be. Conversely, the opposite is true – serious users will require units that can absorb more punishment, and those will cost more. I waited two months to write this because I wanted to make sure that one of your tips about storing food in the fridge actually worked. Particularly, it was about thawing meats inside the fridge, not outside at room temperature. I’ve tried it ever since. Though it takes a little more time, thawing in the fridge section keeps the meats fresh and ready for cooking. You’re right. I’ve done it with fi sh, steak and hamburger patties off my freezer section. It works superbly! Thank you so much for this nugget of information. I love Enrich for useful tips like these. Letters such as yours motivate us, Erning, letting us know that we are on the right track. You see, at Enrich we aspire for our value to be multifaceted, able to touch our readers’ lives in many more ways than simply being entertainment or interesting. Thanks for the compliment and your encouraging email. Oh how I love the Philippines’ Sorsogon. It’s Rizal Beach where I dream to stay for just two days. I remember before my father died, he would bring us every Saturday to a beach or to a resort. Supposedly if my father was still alive, I know we could be in Rizal Beach and would stay for two days. I know it is whole day beach swimming, put our bodies with sand while lying in the sand, make sand castles which will be destroyed by waves as the clock moves into the next hour, and then eat our prepared foods. When we arrive home, we would have sunburns in our skin. In case you’re interested, Lissa, the writer of that article returns twice a year to their 105-year-old ancestral home in Sorsogon, Sorsogon, where his father was born in one of its bedrooms in 1917. His siblings and their children go to each of those places he described in “Beyond the Butandings” when they are there. According to him, Rizal Beach is as inviting as you describe. Thanks for your nice letter and feedback. I am not so religious but I liked very much your 2-part article on Pope John Paul II. Those are amazing miracles that happened in his life and what made me think a lot also is what he accomplished internationally. I still can’t believe he visited 129 countries and spent a total of more than two years outside the Vatican during those visits. And what was good about that write-up, if we may add, Poldo, was that the writer is not an especially religious man in the same way you have described yourself. But it is still easy to see the passion in the way it is written, not to mention his admiration for the pontiff. No prob, and thank you for being candid, Sandro, it gives us a chance to shed some light on something that can be naturally confusing. Washington D.C. borders the state of Maryland, which is in the East Coast of the U.S. It is on the Atlantic Ocean side – same as New York. The state of Washington, on the other hand, is in the West Coast or on the Pacifi c Ocean side – same as California. The distance between the two, Washington D.C. and state of Washington, is actually more than 5,000 kilometers – one side of the United States to the other. I liked very much “Ten Ways to Stay Fit When Traveling” in your March issue. Very good information because I am one of those guilty ones who always gains a few pounds while on vacation. Specially the advice to stick to local food. I think I will try that because before I always looked for fast food or something I recognize. Since we have a monthly section on destinations, foreign and domestic alike, we were pleased to publish a feature covering the good things to do when people are on the road, Julie. The travel writer who wrote it, Michaela Abrera, has plenty of experience behind her and it very much showed in the content. the Butandings.” There is no commercial airport right in Sorsogon province? Unfotunately, there is no airport with commercial fl ights in Sorsogon province itself. However, as the conclusion of the article states, Lepazpi City (in adjacent Albay province) is only 60 kilometers from Sorsogon City, the latter being an excellent base to maintain while checking out all the other sights. pictures taken here in the Philippines? We are proud let you know that, yes they were, Pao. And believe us, the local Volkswagen Club of the Philippines (VWCP) has many other restored VW bugs to brag about. I was 17 years old and present during the inauguration of Araneta Coliseum on March 16 1960. I was with my dad when they announced that there were more than 30,000 in there with us. And what a victory it was for the Philippines! Manny may be most everyone’s hero now, but Flash Elorde will always be mine. And are you aware, Ferdie, that Araneta Coliseum is still the largest indoor facility in Asia,with a dome diameter of 108 meters? And that when Elorde clobbered Harold Gomes that evening, general admission to “The Big Dome” was 80 centavos? Oh and, coveted reserved section seats were five pesos apiece! Im referring to your “7 Most Un-kept Resolutions” write-up. I’d like to tell you that there is someone who has never broken a New Year’s resolution. My husband Rey. And we have been married 14 years. But maybe you are also right because every year I see many people who don’t keep them. Anyway, I enjoyed it. You may not realize how happy we are to hear that, Claire. From experience, it’s not that common for people to succeed at resolutions or promises, and so it’s always great to hear of such positive achievement. You should be proud of your husband. I found Enrich magazine in a Mercury drugstore, and immediately got interested in it. I’m a Manila-based editor, features and travel writer, and I’d like to inquire if there’s a possibility I could apply as a Contributing Editor for the magazine. I’d be more than happy to send in my resume and published articles as soon as I receive your message. I’m looking forward to your response soon. Thank you very much. We have already emailed Ms. Salvador and invited her to undergo our screening process. Who knows, we may see her on the contributor’s page of a not-too-distant issue. Kudos to your magazine. Being true to its name ENRICH. Enriching the mind of your readers with those features found on every page. More power, I can’t wait to grab your forthcoming issues. Being Bicolano, I have always wondered why Mayon Volcano had not received the international recognition it deserves. Your “Vote Philippines” article gives all Filipinos the opportunity to join hands in elevating not only Mayon, but our other national treasures to the worldstage. I showed your feature “The Sheriff Is In Town” to my twin 9-year-old sons. For some reason they have been fans of the Wild West since they were small. They got excited when they read it themselves so we plan to make a trip north next weekend to look for the sheriff. Thanks for the tip. My wife and I have been looking for a new type of place to bring our boys. Congrats on the new mag. Its very impressive and great value formoney. The discount coupons inside are a bonus. I found the article on olive oil really informative. Could I get in touch with the writer for moreinformation? That was a great brand owner interview! I was borderline diabetic and have been taking Charantia with good results. The information you are putting out in Enrich is very helpful, especially since I learned how many Filipinos have high-sugar blood levels after I was diagnosed with it. Keep up the good work! Unfortunately, it’s a too frequent ailment here. Glad that the article helped in some way. Think your magazine’s pretty good. But in your fi rst two issues there’s been nothing on celebrities local or international. What gives? Glad you asked, puzzled. In this month’s issue we feature a local rags to international riches story of a homegrown musical talent – Arnel Pineda. This is a classic journey, with a little pun intended. Since reading your article in the last issue on VotePhilippines. The whole family has started voting in the New 7 Wonders of the World contest. I even got my workmates and boss at it - and he’s a foreigner. But he has been to the 4 places mentioned and some of us haven’t. More power to your great new magazine. with the best. Get your boss to take you all on a company outing next time. I come from Mindoro and found the article Bamboo Whispers very fascinating. My Lolo has told me so many stories about the Indigenous peoples so I bought an extra copy and sent it to him as he now lives with my sister in Sydney. I also liked to read about India as I have not been there yet. Thanks for the great stories and pictures. Thats good to hear Abe! I found the article intriguing also. We never stop learning new things in life. Hope your Lolo remembers some of this. Ask him to contact us if he does. I’m an amateur pilot and enjoyed the “Lofty Highlights of Aviation History” feature in your December issue. What about our own country? Wouldn’t it be interesting to see an article specifically on the history of Philippine aviation? Thanks for your feedback, Maeng. Your suggestion is very well taken. We will certainly consider it for one of our future issues. I’m keen on your “Beyond Our Shores” articles. Since I can’t travel to many of those places, at least I learn something about them. Like the one on Macau. What an interesting mix of European and Asian cultures. We’re lucky to have had foreign contributors from Hong Kong, Singapore, Malaysia, Australia, India and the U.S, with several of them being well-traveled. This affords us the opportunity to provide you an additional dimension different from our local features. We’re happy you enjoy them, Rik! Thanks for the miracle story in your Christmas issue. I got goose bumps at the end. We agree 110 percent, Rochelle. When we thought about doing our Christmas issue, we knew we had to come up with a miracle tale. Of the more than ten we researched and studied, the one at the Battle of the Bulge struck us as the most moving, not to mention the most historically verifiable. Our readers may have noticed that other magazines being sold at Mercury Drug have plastic covers. Enrich on the other hand has purposely left them off because first, Enrich is being sold indoors and therefore safe from the elements. Next, we'd also like to remain environmentally friendly. And finally, it is a trend now quiet prevalent in many of our Asian neighbor countries and we don't mind leading the way in the Philippines.